Allstar Hotel Residence Vinoh is ideally located in the centre of Prague, just over 200 metres from the famous Wenceslass Square. 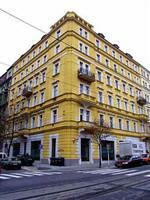 The hotel is located on Vinohradska, one of the citys most famous streets, with a good selection of restaurants, cafes and bars. Many of the other sights in the city, such as Old Square and Charles Bridge are also easily reachable due to the fact the metro Jiriho z Podebrad is less than 100 metres away. This 3 star residence comprises of 25 apartment-like rooms, all of which are en suite and well equipped with air conditioning, heating, soundproofing, sitting area, kitchenette, refrigerator, ironing facilities, cable/satellite TV and hairdryer. Other facilities a 24-hour reception, restaurant, breakfast room, bar, left luggage facility and hotel safe. Continental breakfast is available Hotel Residence Vinoh provides quality accommodation in the heart of the beautiful Czech capital.